Created from 1996 - 2006 for Takashimaya New York. From 1996 to 2006, Denyse collaborated with Takashimaya New York, producing over 60 one-of-a-kind quilts from vintage kimonos supplied by the store. Each traditional Japanese garment yields a limited amount of fabric, so no two Kimono Quilts are alike in design or fabric. The Kimono Quilts are rich in detail and subtle coloring, sophisticated in design, and made in a mixture of silk, linen and cotton. Takashimaya New York presented an in-store exhibition of Denyse’s work on the main floor of the jewel-like department store, which sadly closed it’s doors in 2010. Denyse collaborated with the Takashimaya stores in Japan to produce 30 quilts as part of their sponsorship of an exhibition from the Folk Art Museum in NYC that toured Japan. 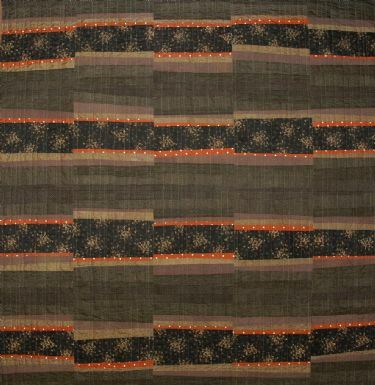 Takashimaya Japan supplied Denyse with yards of specially-made silk lace and raw silk wovens for the quilts. Denyse’s designs paid homage to traditional Amish designs.